Grace & Stella Dr. Pedicure Foot Exfoliating Mask - $14.95 - get rid of rough, dull feet with an innovative foot care product that will unbelievably shed the old, dead, callused skin right off your feet. The formula contains 17 types of natural vegetable extracts help relieve fatigue and give energy to the feet along with skin smoothing and moisturizing ingredients to get rid of coarse, dull and dead skin. It's easy to use just clean your feet, cut open the plastic booties and put one on each feet. They come with fasteners that are supposed secure them around your ankle but mine wouldn't stick so it was much easier to just slip on a pair of socks over the booties to keep them in place and relax for an hour. After one hour remove the booties and wash your feet with soap and water and then soak feet in plain water of another 15 minutes. 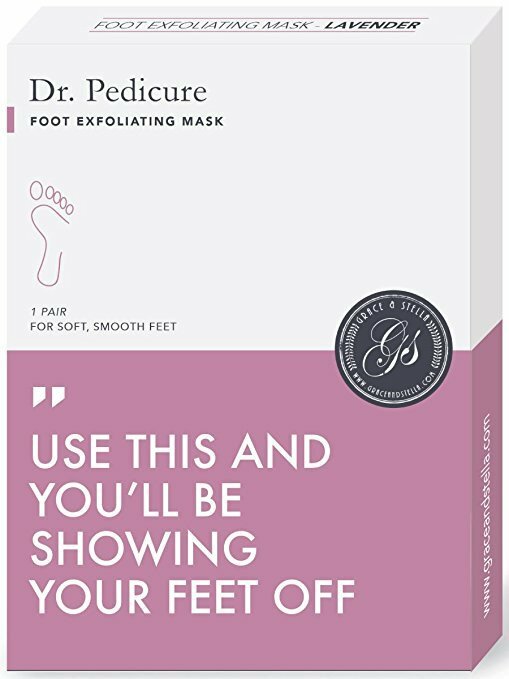 The dead skin cells will begin to peel from 5-7 days after the initial application and they recommend soaking your feet in water every day for the first 7 days after using. You are also not supposed to moisturize your feet during the peeling process as the treatment is meant to completely kill and dry the top layer of skin. There was no way I was actually taking a picture of my own snake feet so enjoy these ones off of the site - you are not supposed to forcibly remove the dead skin on your feet but rather let it peel off naturally - but there was no way I could resist peeling away - so my feet never actually looked like day 3 - there was a disgusting amount of dead skin bits all around the couch though - they are all nice and lovely like day 7 now though perfectly soft and smooth!